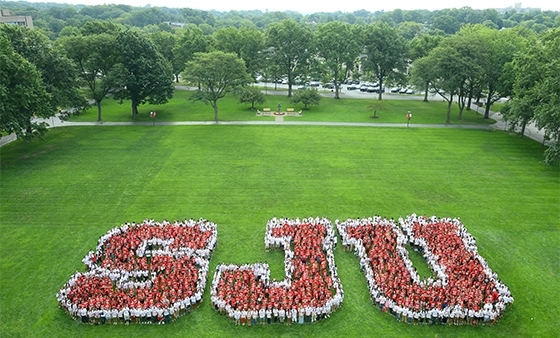 The SJU Bridging Program (Communication & Culture) is designed for Chinese students who want to bring their English language up-to-date and overcome the challenges they may encounter in American higher education classroom. Through this program the students will improve their English language fluency and learn about American culture so that they can adapt to the new education system and American culture rather quickly. Students in the bridging program begin their studies in the Summer three weeks before Fall semester starts. The program will continue throughout the Fall and Spring semester. During semester, class meets twice a week. During the summer intensive training, class meets Monday to Friday for three consecutive weeks. In the morning, students will spend most of their class time with the same teacher working on all language skills – reading, writing, listening and speaking – in one integrated class. In the afternoon, students will attend American culture lecture series. In addition to the core course and lectures, students will take a separate tutor session on pronunciation. Classes are organized around topics, so students can work on their English while learning about different topics in American culture.